And the youngsters, who turned out in uniform, were well rewarded for their efforts at the checkouts by grateful Christmas customers. The Squadron provides ongoing charitable support every year for among others the Poppy and Royal Air Force Association Wings Appeals’. But the bag packs on December 21 and 22 gave cadets the opportunity to raise much needed funds for themselves to help pay for new equipment and off-squadron sporting activities and cultural visits. The Squadron’s Officer Commanding, Flight Lieutenant Dan Laidler, said: “Christmas week is always a busy time, so I am pleased so many cadets gave up two days of their holiday to raise money for the Squadron and help relieve some of the festive pressure on shoppers by being on hand to help pack bags. “Everyone was in good spirits and it was fantastic that so many people gave so willingly and generously. “It is not widely known that the Air Cadet Organisation is a registered charity. As such we are always looking for ways to raise money to help fund our educational and adventure activities. 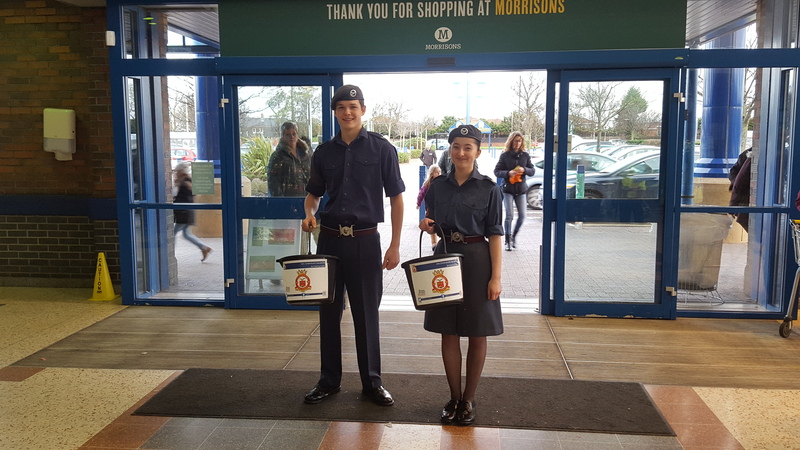 “We would like to thank Morrisons for giving us the chance to raise funds in this way, and we really appreciate that so many people allowed our cadets to help them out. Sgt John David Adams, 16, who is currently studying for his A-levels at Whitley Bay High School, was among the male and female cadets who voluntarily gave up their time. He said: “There was a lot of good humoured banter while we packed the bags, and we had the chance to chat to shoppers, many of whom had ties with our Squadron and happy memories of being a cadet themselves. “I’ve been with 346 nearly four years now. Joining was the best thing I have ever done. I‘ve made lots of friends, had some brilliant experiences and it’s helped boost my confidence. “I know how important it is to raise money for the Squadron so we can continue taking part in the many incredible and exciting activities offered. “I’ve had the chance to do things that other people my age could only dream of, like flying and parachuting, and I got the chance in October to spend 10 days at RAF Troodos on Cyprus. The Morrisons fundraiser came just two weeks after the same cadets collected more than £1,000 at a one day bag pack at Asda Benton towards an adventure training trip to Spain for the Squadron in August 2016. The trip has been planned to complement the exciting and challenging activities the cadets already take part in, which include everything from character building camps at RAF bases both here in the UK and overseas to flying and gliding days, field craft, shooting, sporting competitions, and the Duke of Edinburgh Award programme. The Squadron also has a successful military band and is often called upon to take part in community activities, including conservation work at country parks and helping out at festivals and other events. Flt Lt Laidler added that the bag packs had positively helped raise the profile of 346 (Tynemouth) Squadron. The squadron meets twice a week on Tuesday and Friday nights at its headquarters in Military Road, North Shields. New recruits aged 12 years and over are welcomed and are issued with a free uniform.